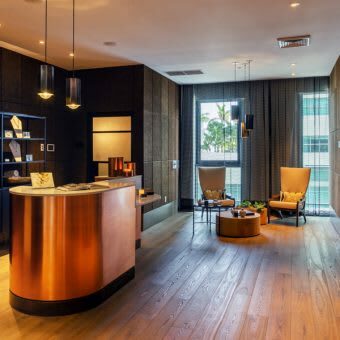 Located in the heart of Miami’s edgiest urban-hip neighborhood, Hyde Midtown Miami puts you at the white-hot center of culture. Entertainment surrounds you in every direction from Hyde’s exclusive amenities to destinations in the neighborhood just outside. 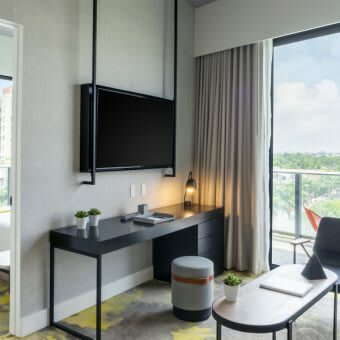 Hyde takes inspiration from today’s most provocative creators of fashion and art, making high design part of everyday life with eclectic and authentic amenity spaces for lounging, fitness and entertainment. Cool city views bring the Midtown vibe to residences and suites as well as indoor and outdoor amenity spaces at Hyde. Hyde Studio features 358 square feet of a stunning interiors by David Rockwell with breathtaking Miami city views sleeping up to 2 guests outfitted with a balcony, sbe Signature King Bed, HD TV, Ciel Reserve Bath Amenities, Kitchenette with Fridge, Microwave and Allessi china and flatware, and minibar curated with sbe signature items. Hyde Suite features 420 square feet of a stunning interiors by David Rockwell with views of Miami’s edgiest urban-hip neighborhood sleeping up to 4 guests outfitted with a balcony, sbe Signature King Bed, HD TV, Ciel Reserve Bath Amenities, Kitchenette with Fridge, Microwave and Allessi china and flatware, and minibar curated with sbe signature items. Hyde Corner Suite features 480 square feet of stunning interiors by David Rockwell with corner views of Miami’s edgiest urban-hip neighborhood accommodating up to 4 guests outfitted with a balcony, sbe Signature King Bed, HD TV, Ciel Reserve Bath Amenities, Kitchenette with Fridge, Microwave and Allessi china and flatware, and minibar curated with sbe signature items. Celebrate the return of spring with your choice of complimentary perk. Select from one of the options below. 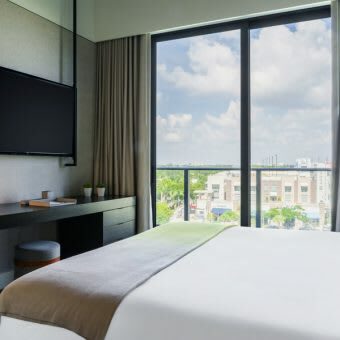 Book a Pick Your Perk stay from April 1 through September 1, 2019. Complimentary parking Waived facility fee Early check in or late check out Offer subject to availability. * A facility fee of $20 per day, per room (plus tax) will apply to your booking. 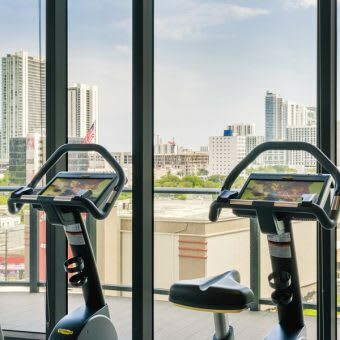 The fee includes WiFi access throughout the property, access to our fitness center and house care drop off just to name a few. 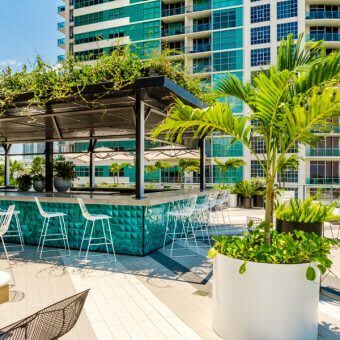 Whether you are having a drink with friends or hungry for a bite, Hyde Midtown's poolside bar and grill will offer guests with a selection of handcrafted cocktails and savory foods. Our Fitness Center features cardio machines, spin bikes, and free weights. Personal yoga and fitness classes are also available, we'll even handle your fitness apparel laundering, no sweat. Leave the driving to us. 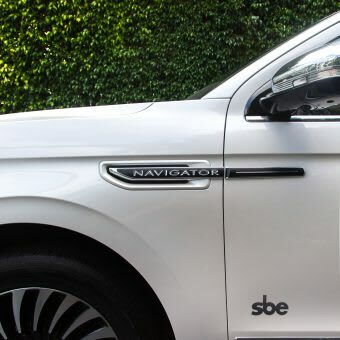 Our luxurious Lincoln house car is available on a first come, first served basis and provides a complimentary drop off within a 10 block radius (based upon availability). 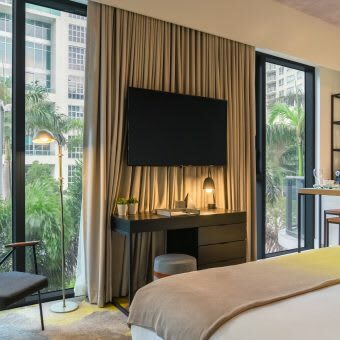 Whether you are having a drink with friends or hungry for a bite, Hyde Midtown’s poolside bar and grill will offer guests with a selection of handcrafted cocktails and savory foods. Our Fitness Center features cardio machines, spin bikes, and free weights. Personal yoga and fitness classes are also available, we’ll even handle your fitness apparel laundering, no sweat. Don’t miss your opportunity to live in Midtown’s latest addition, offering the finest spaces to all residents. Only a few residences available.